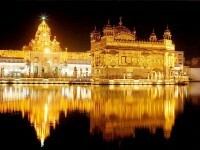 Amritsar is the spiritual and cultural centre of the Sikh religion. It is not surprising then that the main attractions of Amritsar are the temples, and that visitors come primarily to experience the spiritual potency of the city. The Golden Temple is considered one of the most beautiful places of worship in the world, and it is one of India's top tourist attractions. Other wonderful temples in Amritsar popular with tourists include Harmandir Sahib (best visited at sunrise) and the Durgiana Temple. The political seat of the Sikhs, Akal Takht, is also a lovely and moving place to visit. Aside from the inspiringly friendly and humble people, probably the best attraction a city can have, Amritsar is famous in the history books for being the site of the terrible Jallianwala Bagh massacre of 1919. This tragedy is memorialised at the original site of the massacre, in the Jallianwala Bagh Garden, and is an interesting attraction to add to your itinerary in this holy city in order to gain some historical perspective, particularly as the people killed were gathered to worship at a religious festival.